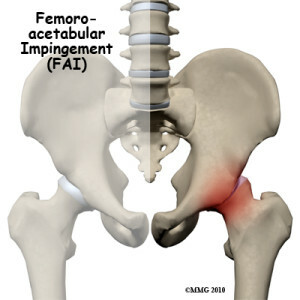 Femoroacetabular Impingement (FAI) Femoroacetabular impingement also called as FAI occurs due to the structural abnormalities in the bones that form the hip joint. The ends of the two bones that form the hip joint have abnormal shape due to which the bones tend to move against each other creating unnecessary friction and damage to the joint and thereby pain in that area. What does a hip joint look like normally? A hip joint is basically a ball-and-socket joint. The femur or the thigh bone has a portion named femoral head that forms the ball and the socket is acetabulum, a portion of the pelvic bone. The two surfaces of ball and socket are covered with articular cartilage that allows the movement of the bones with very little friction. The bony ends smoothly glide during movements. Labrum is a type of fibrous cartilage that surrounds the joint for better stability of the hip joint. What happens in a person with FAI? 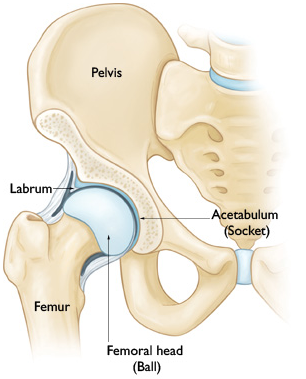 When a person is suffering from FAI, his femoral head or sites on the acetabulum grow projections. Due to the abnormal growth the bone ends tend to strike against each other while hip movements. Normally the bone ends move smoothly against each other but bony outgrowths make movements difficult and painful. There comes a time when repeated rough movements lead to the labrum tears and damage to the articular cartilage. What are the types of FAI? FAI can be of three types generally- Pincer FAI- This is when the acetabulum is defective because of an extra growth of acetabular bone beyond the normal edge. Such a growth can prove to be extremely injurious to the labrum and can lead to a crushing injury. 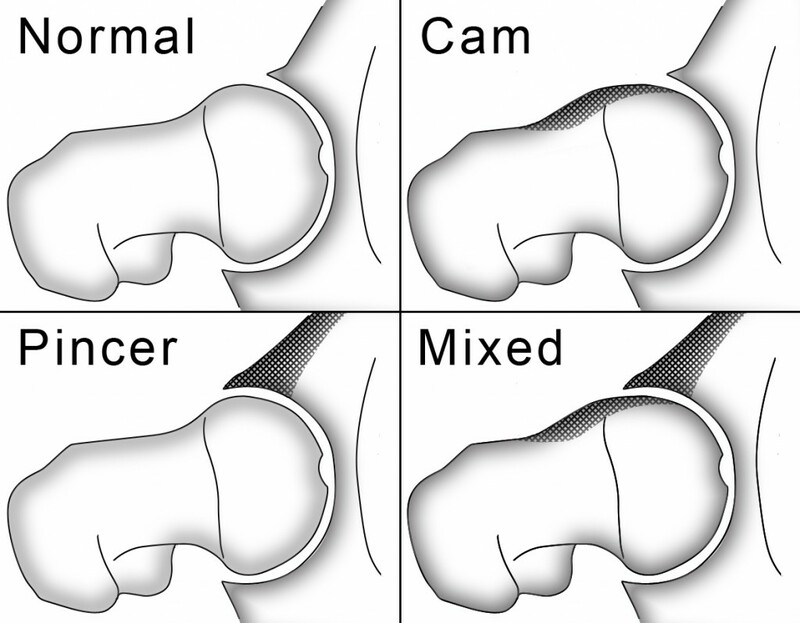 Cam FAI- The CAM type of FAI is due to the defect in the shape of the femoral head. Instead of being round, the shape of the femoral head becomes distorted due to bony growth. This restricts the normal rotation of the femoral head within the acetabulum and hence the hip movements become tough and painful. In due course of time, the cartilage starts wearing away due to chronic rubbing. Combined FAI- This type of FAI has the combination of both Pincer and CAM type. It simply means that both the femoral head and the acetabular rim have bony overgrowths. The degree of movement difficulty increases with increased complexity. It is tough to realize whether one has this problem until the symptoms appear. The best part is that some people live their lives undisturbed and actively along with FAI and never counter any trouble like limited movements. Those who develop symptoms have already undergone harm to their labrum or articular cartilage. In such cases, people come up with the complaints of hip joint pain, inability to walk straight and experiencing a rigidity that restricts their free hip movements. 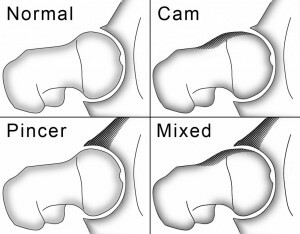 The symptoms of FAI show a variation from one individual to another. Some have reported to have a mild ache all throughout. Others have severe pain in the groin region mostly specially while squatting. If you suffer from hip pain or low back pain that has not improved despite various measures, contact our renowned and talented sports medicine specialists at Orthopedic Surgery San Diego to undergo an evaluation.